Ever wonder what it would be like to make a movie with your action figures? I think most collectors - and certainly most kids - have considered it. Heck, a few of us have even tried. A buddy of mine and I made a few attempts with an 8mm camera and some G.I. Joes when I was about 10, and while we weren't M. Night Shyalaman, we had a lot of fun trying. The folks at Action Figure Movies are doing more than thinking - they have produced their first film using nothing but sixth scale characters. 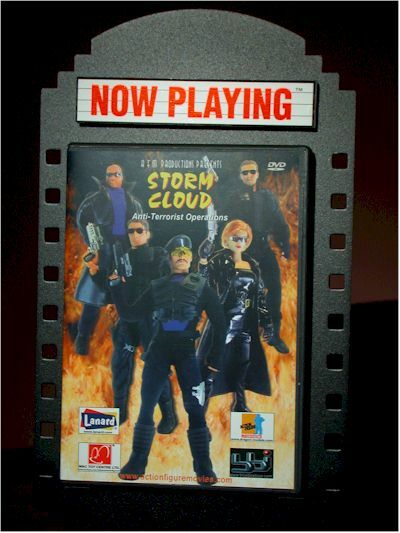 They have gotten help in the form of figures, vehicles and playsets from Dragon, bbi, and Lanard, and put together a 30 minute stop-action movie called Storm Cloud. They have plans to continue the movie making process, and have a trailer up at their official website of their next release. They sent over a copy of Storm Cloud this last week, and I kicked back and watched it on the big screen. Rather than include this with my usual movie reviews, I thought I'd place it in with the action figure reviews. It won't follow either format, but instead will be more general and rambling than my usual work. I watched the movie wearing two hats. Both on the same head. It was quite a sight. One of the hats was as an action figure fan and collector. The other was as a movie fan. It's important to consider the work from both perspectives, and keep an open mind. The plot is fairly straight forward. A covert group of military types is assembled from around the world, working against various terrorist factions. Rather than swear allegiance to any one country, they are controlled by a billionaire who came up with the scheme and somehow managed to convince the U.N. that giving a rich megalomaniac military power is a good idea. 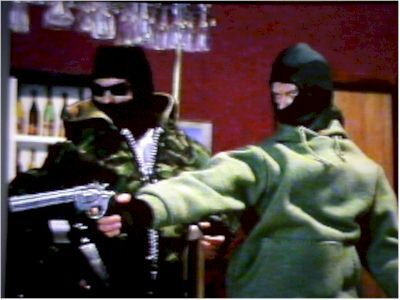 They pull together a variety of people - portrayed on screen by some of your favorite bbi and Dragon figures including the Cy Girls - but can't manage to convince the one they really want, a lone wolf character awfully reminiscent of Stallone's Cobra. They do manage to convince him of course, and that's really the purpose of this first 30 minutes. There isn't a particularly grand story here, with the entire film simply setting up what the team is, showing us some training, and setting the stage to convince this one character to join up. The writing is very basic, and some of the dialog unrealistic and stilted. There is a little twist in the story if you're paying attention, implying that the kindly old billionaire might not be quite so kindly when there is something he wants, but overall you know exactly where this is going. And really the entire story is just a set up for the stop-motion work. The voice talent is the biggest problem for the entire film. They need to consider either working very hard on their own abilities in this department, or finding some local acting talent for the next film. Much of the dialog sounds like it's being read from the page, and the occasional attempt at accents or unique speech patterns is truly bad. The one bright spot in the voice acting is Cecille Valin, who handles all the female voices. While you'll recognize immediately that it's the same woman, her ability to put the correct inflection and tone into her few lines was much appreciated. As I said, the story and acting are merely window dressing, and the real purpose here is to showcase the stop-motion sixth scale world they've created. That they've done admirably. There's lots of motion throughout, and while a few more frames here or there would have smoothed things out a bit, overall the action looks good. There are several hand to hand fight scenes, and the punches, kicks and flips all work well. Also, rather than animate the mouths, they use head and body movement and posture to signal speech. This was a smart move, and does give you as much emotion from the characters as you could expect. This all adds up to plenty of work on the stop-motion side, and I'm sure that weeks went into some of the more elaborate fight sequences. The sets and scenery are no slouch either, with lots of attention to detail in every diorama. Some of the props you'll recognize from Barbie sets, but others are clearly hand made. A lot of time was put into each location, and that helps the overall realism of the film. The sound and visual effects are also fairly well done. 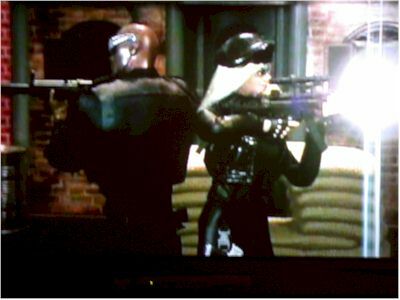 There's a variety of sound effects throughout the movie, and the gun blasts and explosions are all clean, clear and have quite a bit of variety. There is a section of CGI work in the middle of the movie, showing off the group's fighter plane, and that's fairly decent work. Some of the long range external shots of city scapes or buildings are also computer rendered, and I have to wonder if perhaps using real locations would have worked better. They may have tried this and found the dichotomy between the toys and reality just too disconcerting when viewed together, and it's tough to second guess them on this one without seeing it both ways. The film itself is presented in full screen. The music and sound are in stereo, and sounded fairly good when I used a Dolby Prologic set up. You might want to try playing around with 5 or 7 channel stereo as well to see how it sounds. The music itself is an interesting techno mix, and was done specifically for the film. It conveys the mood of most scenes well, but is often too loud and tends to jump in your face, rather than provide background ambiance. There's also a short (20 minute) commentary by Philip Lane, co-creator and director, answering some of the more common questions. It's not bad, but I would have preferred some actual footage showing them working through the process of stop-motion, behind-the-scenes footage of their discussions and working together, and maybe even some more in depth information on the building of the dioramas. You can also jump to various scenes, but there are only five of these provided. I also couldn't use the timer to jump to a particular moment on the DVD, so you'll find yourself fast forwarding and rewinding a lot if you're trying to get to a particular scene. That's not particularly surprising for a low budget, self produced effort like this. In the end, what this film really reminds me of is if you got together with a bunch of your friends and did a movie with your action figures - which is exactly what they did. The writing and voice acting are nothing spectacular, and the film won't be getting any awards, but the dioramas and stop-action work is better than average. The obvious purpose of this movie is to show off the stop-action, with story and acting taking a distant back seat on the bus. While that's fine for the first attempt, I hope to see more attention paid to what the filmmakers want to say with the medium, rather than just playing with the medium itself. Stop-action is a form of animation, and animation works best when it's used to tell a story that otherwise might not be possible. Films like Fantasia, Toy Story, Chicken Run or Monsters Inc. have at their core excellent stories that are perfect fits for the medium, and would be difficult or impossible to do in any other way. That's what I think AFM needs to focus on - finding stories that make sense with the use of action figures. Simply telling stories that could just as easily be done with human actors will leave their audiences unexcited and less likely to come back for more. Worse, human actors and true animated characters are able to provide much greater emotion and expression than action figures. That hinders them further from being able to really exploit any sort of serious plot in a way that the audience can except. There are plots out there that would benefit from this though, and would most likely be a combination of human and action figure interaction. Allow the action figures to BE action figures, and don't try to use them to simply replace humans. I think that moving in that direction would open up a lot of possibilities for them, and also allow them to gain a much wider audience. Storm Cloud would never be a film festival entrant, but I can imagine story lines and plots that could use their skill sets and be neat independent films. combining your action figures with film. If you do pick this up, take my advice and DO NOT let any of your non-collecting friends and family watch this - unless they are under the age of 10. If you do, you'll never live it down.